Oceanic Whitetip Shark Belongs to the group of Requiem Sharks. It is also known as the Sandbar Shark, Oceanic White-Tipped Whaler, Brown Shark, Nigano Shark, and Silvertip Shark. This shark species has been described as the most dangerous of all sharks. They prefer deeper ocean water and generally hunt at depths around 490 feet below the surface. This shark is a member of the genus Carcharhinus. It has a stocky build, a short, bluntly-rounded snout, and incredibly powerful jaws. Oceanic Whitetip Shark is a slow swimmer. However they are capable of short bursts of impressive speed. These sharks often exhibit dog-like behavior so they have got a popular nickname ‘sea dogs’. Oceanic Whitetip Sharks are named for the distinctive white tips on their fins. The dorsal side of their body can be a brown, grey, or grey-bronze color and the underside is white. A counter shading effect gets created because of this specific coloration of these sharks. They prefer warmer waters with temperature between 68-82°F and they migrate to warmer waters when temperature decreases. They never sleep because they have to constantly swim to pump oxygen over their gills. They are highly valued by fisherman for their delicious meat. Their hyde is also used for leather. Their lifespan in the wild can reach 15 years. The longest known lifespan in the wild is 22 years. Declan, Tobin. " 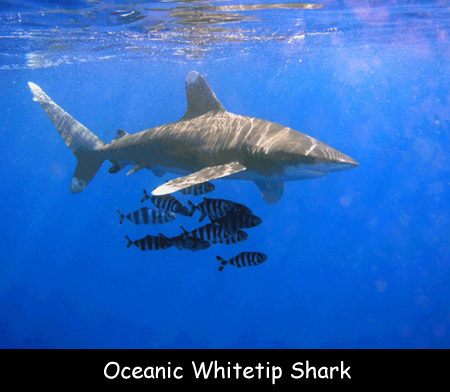 Facts about Oceanic Whitetip Shark for Kids ." Easy Science for Kids, Apr 2019. Web. 21 Apr 2019. < https://easyscienceforkids.com/oceanic-whitetip-shark/ >.